We are proud to announce Dr. Doblin’s office now offers the popular Juvederm Voluma Ultra XC and Ultra Plus XC products. Voluma injectable gel is used exclusively for cheek enhancement. The result is a subtle lift, and a more youthful, vital appearance. Voluma is the first and only FDA-approved filler that addresses age-related volume loss in the middle area of the face. Juvederm products have been used for years to give patients desired results. Voluma treatments are conducted with a local anesthetic to make the experience a comfortable and quick one. Best of all, Voluma lasts up to two years, which is longer than other fillers currently offered. Dr. Doblin is an expert in patient assessment and injection techniques related to Voluma. Our goal is to create a difference in your cheek area that you, your family, and friends will notice within weeks of treatment. Did you know there are three distinct areas to the cheek? They are the apex, the apple, and the hollow. 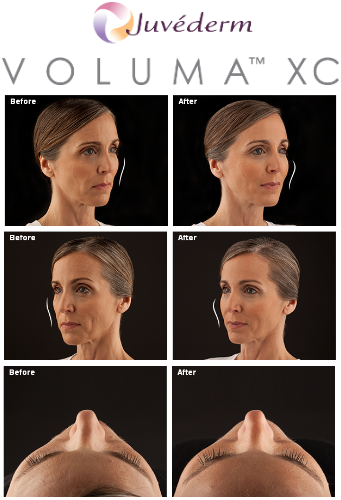 Voluma is formulated to add volume to all three areas. Patients can usually resume normal activities after just one day. Side effects are temporary and moderate. The soft, smooth, natural look will make you wonder why you didn’t choose Voluma sooner. Call NJ COSMETIC CENTER TODAY!